Lucien Bernard is a conflicted man. 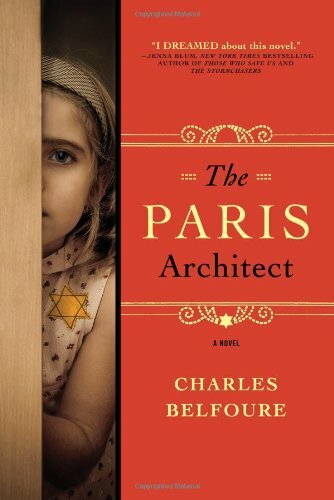 Author Charles Balfoure has set his novel The Paris Architect during the Occupation of France in World War II. Lucien Bernard is an architect, solicited for a testy job—finding some way to build a hiding place for Jews. His first reaction is NO; he has no sympathy for the Jews and prefers not to be associated with helping them. It does not take long for Manet, the man who pays for Lucien’s services, to convince him, both financially and morally, of the right thing to do. Lucien agrees to help, just this once, and of course, just this once turns into again and again. Initially, Lucien enjoys the challenge of thwarting the Nazi faction that has invaded his beloved city, and he quickly designs a clever hiding place in an apartment owned by Manet. As more opportunities present themselves, other situations in his life begin to turn sour: his marriage crumbles when his wife, Celeste, considers him a collaborator; his mistress, Adele, takes up with a Nazi officer; and one of his hiding places fails, resulting in the deaths of two hidden Jews. Mr. Balfoure introduces several levels of conflict to his story for Lucien to deal with, including a new employee, Alain, who, unbeknownst to Lucien, is the nephew of a Nazi officer and begins to suspect that things are not all they seem with his employer. Adele’s affair snarls up the works when her Nazi paramour gives her a country home that happens to have one of Lucien’s hiding places, and it is discovered. And although he himself is having an affair, he is aghast when his wife announces that she is leaving him for another man. When Adele’s lover engages a sinister gangster character named Messier to hunt down the creator of the clever hiding places that are protecting Jews, the story takes a darker turn. In this his first novel, Mr. Belfoure has a knack for designing a tale with high tension and deep conflict. There are few situations that can deliver those elements as clearly as that of European Jews during the Holocaust, and The Paris Architect delivers the tension that is needed to make this an interesting tale. Nothing is what it seems as the story turns down one path then does a quick turn around and follows another path. The characters are well drawn, and at the end of the story, the reader will be satisfied that some people—even the worst—may not be what they seem. Although some of his writing is passive, slowing down certain passages, the author keeps the story so engaging the reader keeps turning the pages, which is, of course, the goal of any good writer.